You have come to the website of Steelweld Machinery, a pioneer in the field of press brake and shear equipment. 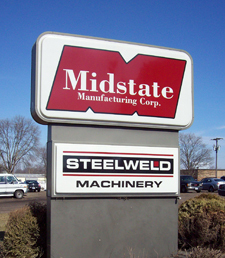 Steelweld Machinery is a division of Midstate Manufacturing Company of Galesburg, IL. Please use the links to the left side of the page to navigate through the website. We welcome your comments and suggestions on how we can make this site work better for you.